Wabash junior Geoff Lambert qualified for the NCAA Division III Indoor Track and Field National Championships with the fifth fastest seed time, but he nearly brought home the national title after a courageous race in the finals. Leading down the main straightaway, Lambert ultimately finished second in the 800-meter run finals to earn All-America honors for the second time in his career. Click here to see photos from the national meet. 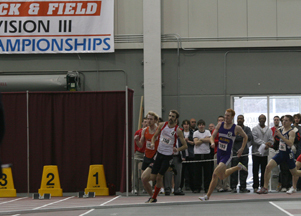 The Chesterton, Indiana native crossed the finish line in 1:53.84, trailing only Jimmy O'Brien from Ohio Northern. O'Brien won with a time of 1:53.48. 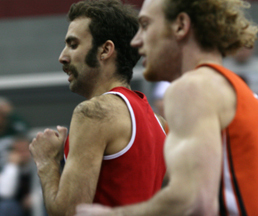 The talented runners (pictured below right) ran side-by-side over the final 200 meters with Lambert just ahead until the final 50 meter sprint. Lambert won the first heat of Friday's semifinals with a time of 1:55.07, the top time among the 11 national qualifiers. However, about two-thirds of the way through the qualifier, Lambert was spiked by an opposing runner on his left ankle and sustained an injury. Running in lane four in the championship race and with his ankle tightly wrapped, Lambert fell behind the lead pack early and got boxed in. Twice he built momentum for a run to the front and each time was rebuffed. Finally, Lambert burst through the pack with 150 meters to go. He held the lead at turns three and turn four, but O'Brien nipped him down the stretch. "I'm really proud of Lambert's courageous effort," said Wabash Track Coach Rob Johnson. "He had bad position through most of the race and ended up having to run up and around a few guys. He's just a super kid and a great athlete." Lambert becomes an All-American for the second time after finishing fifth in the 800 at the 2006 Outdoor National Championships.